Crystal Webb is an emerging talent on the local tennis circuit. Webb’s achievements were reward for perseverance, as she was at the receiving end of heavy defeats in previous outings. But these did not deter the bubbly Webb, a student of the sport for three years. A Grade 5 pupil of the C W Prescod Primary, Webb, born in Sion Hill before moving to Upper Cane Hall, was the lone light for the Great Head Tennis School, under the tutelage of Walford Mc Kie. The young tennis player is following the footsteps of Romano Mc Kie and Whitney Harry, who are also members of the Greathead set up. Webb was not the only one that held the spotlight at the closing ceremony last week Thursday night at the National Tennis Centre at Villa. Roxanne Russell secured three titles. She won the Under-16 and Under-18 singles and teamed up with Daniella Cupid to take the Under-18 Doubles. 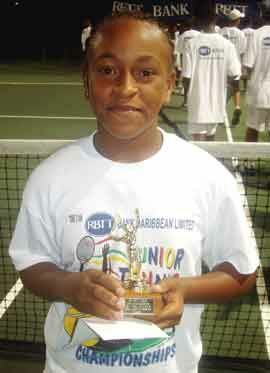 As the passing of the baton continues, Fabrice George took the Boys’ Under-14 singles and Under-14 titles. He doubled up with Damani Taylor as Under-14 pair’s champions. George was also the recipient of the Challenge Trophy for sportsmanship and discipline on and off the court. Zachery Williams was the Boys’ Under-10 winner, with Halimah Michael taking the Girls’ Under-12 glory. Michael was again in winner’s circle along with Dayena Charles, as the duo procured the Under-14 doubles. Michelle Gun-Munroe was the Girls Under-14 singles winner. Shane Huggins enhanced his status as the more accomplished juniors have advanced in age, by taking the Under-18 singles. Kevin Huggins took the Boys’ Under-12 singles, the other title up for grabs. Another Huggins, Khir, was adjudged the Most Improved Male in the championship. Myles Dalrymple captured the trophy for the Most Improved Male player. The 2006 junior tennis championship is in its 11th year of sponsorship RBTT. In former years, the Caribbean Banking Corporation (CBC) sponsored the tournament.